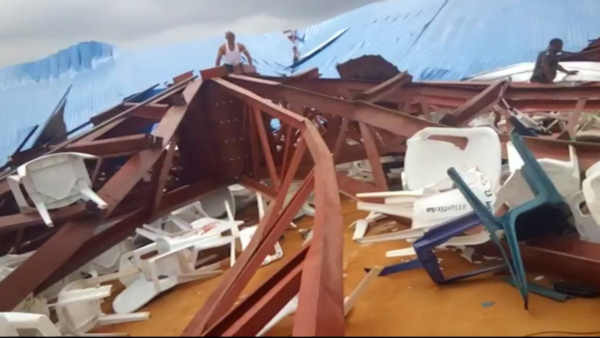 LAGOS, Nigeria -- Metal girders and the roof of a crowded church collapsed onto worshippers in southern Nigeria, killing at least 160 people with the toll likely to rise, a hospital director said Sunday. Hundreds of people, including Akwa Ibom state Gov. Udom Emmanuel, were inside when metal girders crashed onto worshippers and the corrugated iron roof caved in, they said. Emmanuel and Weeks, who preached that God will make his followers rich, escaped unhurt. He tallied 90 bodies before he was told to stop counting on Saturday night, Peters said.